The world has two kinds of people. Some people are like open books. One conversation and at the end of it you might even know which color candy they loved in their childhood. There is no denying that sometimes, you’re also left with too much unnecessary info. The other kind is where you could be friends with someone who over 5 years and still don’t know which month their birthday falls. Now you might be wondering what I’m trying to prove here. Well, actually that’s the thing. I’m not trying to prove anything. Nobody likes to bottle up emotions. There’s nothing wrong with being talkative and open just like there is no fault in being exclusive and low-key. Some people actually consider opening up as a sign of weakness. They think that if they open up to people, they might be vulnerable and it shall become easy for people to hurt them. Now, this way of thinking might’ve evolved due to past experiences or maybe it was always in them to keep their guards high. Even though opening up too much can cause issues in life, not opening up at all doesn’t guarantee anything different. Everyone needs to lower their walls in their lifetime. To maintain friendships and relationships you need to let people know how you genuinely feel. It makes it easier for people to understand you. Some people put their guards down quickly. Whereas some people take years. It depends completely upon you how hard you’re willing to try and how much value that person possesses in your life. 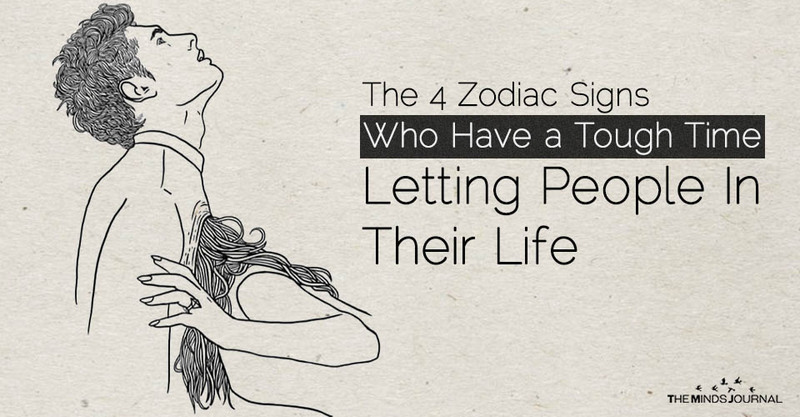 We can’t, of course, tell you when a person will open up to you, but we can, in fact, tell you about the zodiac signs who have a tough time opening up. Don’t say nobody told you eh! To know which zodiac signs take a lot of time and effort to open up, continue reading. Some of the toughest people you’ll come across in life will belong to the sixth astrological sign of the zodiac, Virgo. When everyone desperately desires to be the center of attention, a Virgo will hate the limelight. They are very shy in nature and are very timid. They do not like to be in a position where all eyes are on them. It’s going to take you a lot of time to make a Virgo comfortable enough to open up to you. They’ll choose to bottle up their feelings, rather than being verbal about it. So if you genuinely want to keep a Virgo in your life, you will have to be very patient with them. That’s the only way you can help them in putting their guard down. People belonging from this zodiac sign are known to have a mysterious appearance. This proves that there is nobody that knows everything about them. Every time you think that you’ve finally come to know everything about a Scorpio, they’ll shock you with something new. However, Scorpio’s are very expressive in nature. It’s just that they do not talking about themselves a lot. This is why most people get confused. You have to be very careful when you’re with a Scorpio or while having a conversation with them. They register everything in their mind, and once they have a doubt on something that you said or did, you should totally forget about them opening up to them. Also, if you genuinely want a Scorpio to open up to you, you have to keep your ears open like a 24*7 fast food counter and your mouth shut like the cookie jar. Scorpios really like people who listen to them when they are overflowing emotions.